Cards That Never Were is a recurring series in which I create virtual trading cards for players missed in various sets. It is a concept I have borrowed from too many others to mention, but I appreciate all of their efforts. Jack Marin was selected fifth overall by the Baltimore Bullets in the 1966 NBA Draft. He made his debut in the 1966-67 season and stayed with the Bullets through the 1971-72 season. He spent a season and a half in Houston before joining the Buffalo Braves (now the Los Angeles Clippers). He played with the Braves until early in the 1975-76 season when he joined my beloved Chicago Bulls. 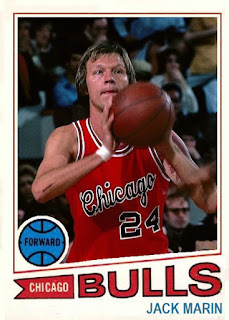 He finished that season and played one more, before retiring after the 1976-77 season. Marin appeared on his first Topps card in their 1969-70 set. He got a card in every set through the 1976-77 set. The first two misses are hard to correct. Coverage of the NBA back then was scarce. 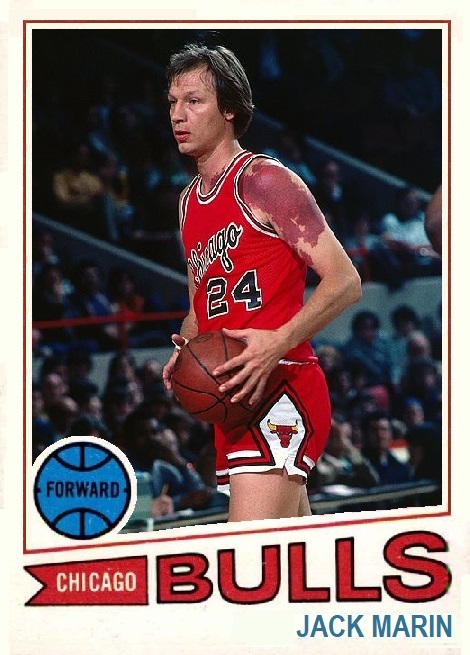 I did find a couple nice pictures for Marin's "career capper" 1977-78 card with the Bulls. I don't usually create 2 cards from the same set, but I liked both of these images and Marin was one of my favorites.